Editors for all the supported languages provide the Syntax Highlighting functionality with many options for color and font customizations. 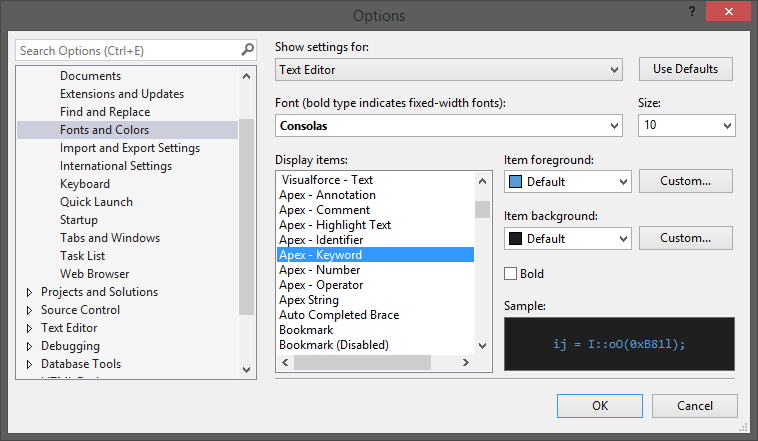 To change the syntax highlighting settings, open the Options Menu: Main Menu ⇒ Tools ⇒ Options… ⇒ Environment ⇒ Fonts and Colors, where you can find the settings for all supported languages and their elements. For example, Apex has such customizable options as Apex - Annotation, Apex - Comment and so on. In addition to the syntax highlighting options, you may also change colors of the bookmarks, brace matching colors, search highlighting colors, and many others.